Not exactly your typical cherub! Highly detailed 1:6 scale statue inspired by the movie Krampus. Note the cracked face, bloodshot eyes, sharp teeth, eagle talons, and clawed feet. Not a creature you want to meet in a dark attic on a cold Christmas Eve! Sculpted by Weta Workshop's Jane Wenley. Krampus is coming, and he left a special delivery in a grimy sack at your front door. Don't bring it in, because hidden inside are all manner of Christmas beasties, including this "cherub" that is anything but! 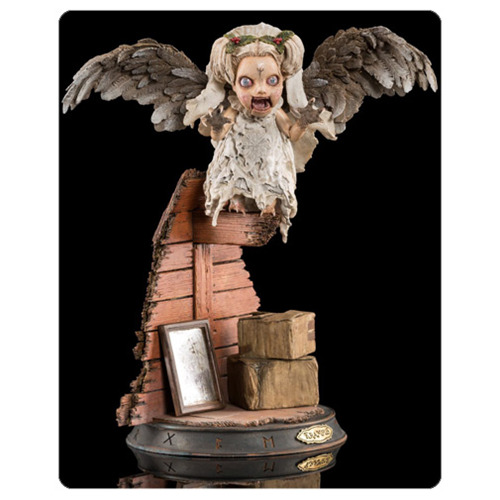 The highly detailed Krampus Cherub 1:6 Scale Statue is sculpted by Jane Wenley and measures about 10 1/5-inches tall x 8 2/3-inches wide x 7 9/10-inches long in polyresin. Close inspection reveals a cracked face, bloodshot eyes, sharp teeth, beastly eagle talons, and clawed feet… details that cut right through this character's cute first impression. Make no mistake, this not a creature you want to meet in a dark attic on a cold Christmas Eve! Weta Workshop's Jane Wenley worked on aspects of the Cherub puppet used in the Krampus film, Krampus' hooves, and the Dark Elf masks. To ensure accuracy and the best possible representation of the character, she sculpted this highly detailed piece alongside the actual prop, taking many caliper measurements and investigating exactly how the film prop was put together.